Milky Way is one of many quilt block patterns that are sewn using a variation of the popular Friendship Star. For Milky Way, the star blocks are linked by four patch units at their outer corners, rather than plain squares of fabric. The Milky Way quilt pattern has a unique characteristic—blocks cannot be sewn together side by side to achieve the appearance of light stars next to dark stars as shown here. Instead, a Milky Way quilt is designed by allowing adjacent blocks to "share" a third of their design (see page 2 for a preview). It isn't necessary to sew the quilt blocks and their shared links together into one unit before you begin assembling the quilt. If you're making a scrap quilt, it's best not to assemble the blocks into units, because leaving components free of each other offers a lot more versatility when it's time to design the quilt. Milky Way looks wonderful as a scrap quilt but is also gorgeous when sewn with a couple of vibrant colors. This version, which uses (in part) breast cancer awareness fabrics, is simply one example of the layouts you can create, and its fabrics do not contrast as much as fabrics in the majority of Milky Way quilts. For an alternative layout, be sure to look at the blue variation of Milky Way, on pages 6 and 7. Finished Quilt Size: 48" x 57"
Batting: about 58" x 67"
Here's the arrangement of a basic Milky Way quilt block with its linking units. The individual block is at the upper left and has green/dotted four patch units at its four corners. To its right is a strip that includes the central section of the next (vivid pink) star in the series. The strip that runs horizontally across the bottom of the unit is the central section of another vivid pink block, with what becomes the center of a light block at its right edge. Illustrations on the following pages should clear up any confusion about the quilt's layout. See page 7 for the blue Milky Way quilt block. First let's make 20 Milky Way quilt blocks, without their side and bottom linking units. Milky Way quilt blocks require half square triangle units. The instructions assume you will use the sandwich method to construct the units—alter cutting instructions if you choose another technique. Units must finish at 3" x 3" (in other words, measure 3-1/2" x 3-1/2" before sewing them to neighboring patchwork). Do not cut all fabric for any quilt pattern until you have made a sample block. Special instructions for scrap quilts: you won't need to cut strips, but you will need the same number of 3-7/8" light and dark squares and 3-1/2" light squares; cut (160) 2" x 2" squares to replace the green and (160) 2" x 2" squares to replace the pink dotted fabric. Sew a 2" green strip lengthwise to a 2" pink dotted strip. Press the seam allowance towards the green strip. Square up one end of the strip set and then cut as many 2" segments from it as possible. Sew remaining 2" green strips to 2" pink strips in the same way. Cut a total of (160) 2" segments from the strip sets. Sew two 2" segments together, placing like-colors diagonally from each other. Press seam allowance either direction. Repeat to make (80) identical units. Pair a 3-7/8" x 3-7/8" vivid pink square with a light square of the same size. Use the easy sandwich method to sew the pair together, creating two half square triangle units. When complete, each unit should measure 3-1/2" x 3-1/2". Combine remaining 3-7/8" squares, in the same way, to create (80) half square triangle units. Arrange (4) four patch units, (4) half square triangle units and one 3-1/2" light square into three rows as shown; the light star should be visible. Take care to position half square triangles exactly as illustrated. Sew components of each row together. Press seam allowances away from half square triangle units. Join the rows, matching seam intersections carefully. Press. The quilt block should measure 12-1/2" x 12-1/2". Make a total of (20) Milky Way quilt blocks. Milky Way block linking units are assembled with squares and half square triangle units. 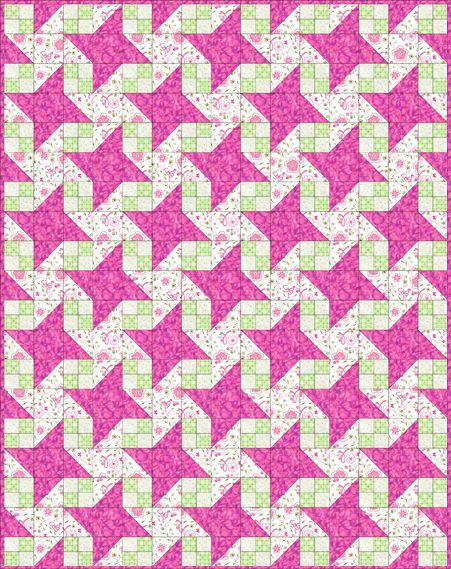 Use the easy sandwich method to pair all light star 3-7/8" squares with vivid pink squares of the same size. You'll have 32 half square triangle units; 31 are required. Arrange two half square triangle units and one 3-1/2" vivid pink square as shown in the top illustration. Double check the slope of your triangles. Sew the three units together and press the seam allowance towards the pink center. Repeat to make 31 identical units. Gather 15 of the units you just created. Sew a 3-1/2" light star square to the left end of the 15 units, taking care that the slopes of triangles are as illustrated—Press seam allowances towards the light squares. For scrap quilts: You won't need to cut long strips, but you will need the same number of squares listed in cutting instructions. The first two rows of the Milky Way quilt are illustrated. I've made the Milky Way blocks a bit transparent to show a clear view of linking unit placement. Arrange four Milky Way blocks into a horizontal row, leaving a little over 4" or so of space between them. Place a (longer) linking unit with a light square at its end vertically between each block. Place a (shorter) linking unit horizontally beneath each Milky Way quilt block. Place four more Milky Way quilt blocks under the (shorter) horizontal linking units. Now place three more (longer) linking units vertically between the second row of Milky Way blocks, just as you did for the first row. Sew a row together. Look at your top row. Sew the horizontal linking unit beneath each block to the block. Press seam new allowance towards Milky Way blocks. Sew the more extended vertical units between the blocks. Press. Sew components of each row together and press. Join the rows to complete the quilt top. Press. Mark the top for quilting if necessary. Sandwich with batting and backing and quilt. Finish by sewing on the binding. Fabrics in this Milky Way quilt contrast more than fabrics used in the quilt on page 1, making the side-by-side stars more visible. Four patch units are somewhat neutral, but also contrast just a bit more with the star fabrics. Light and dark stars differ, too. Dark stars are used within the Milky Way blocks in this version, and light stars become visible when you add the linking units. To make this quilt, substitute blue, and neutral fabrics as shown for the colors in the first arrangement, or play around with your color layout. Remember that blocks will be assembled with a dark star and links with light fabrics, the reverse of the instructions on page 3. You'll find a close-up of the blue Milky Way block on the next page. Here's a closer view of the blue Milky Way block and its linking units.